Welcome to eNTeNG c”,)™©'s world – food, wristwatches, good times, even better friends.. Luxury gleams on the world’s best shopping street. SOME SAY that luxury has lost its luster. But all you need here in the Lion City is take a leisurely day of shopping on Orchard Road to see that it – luxury – has in fact lost none of its charms. 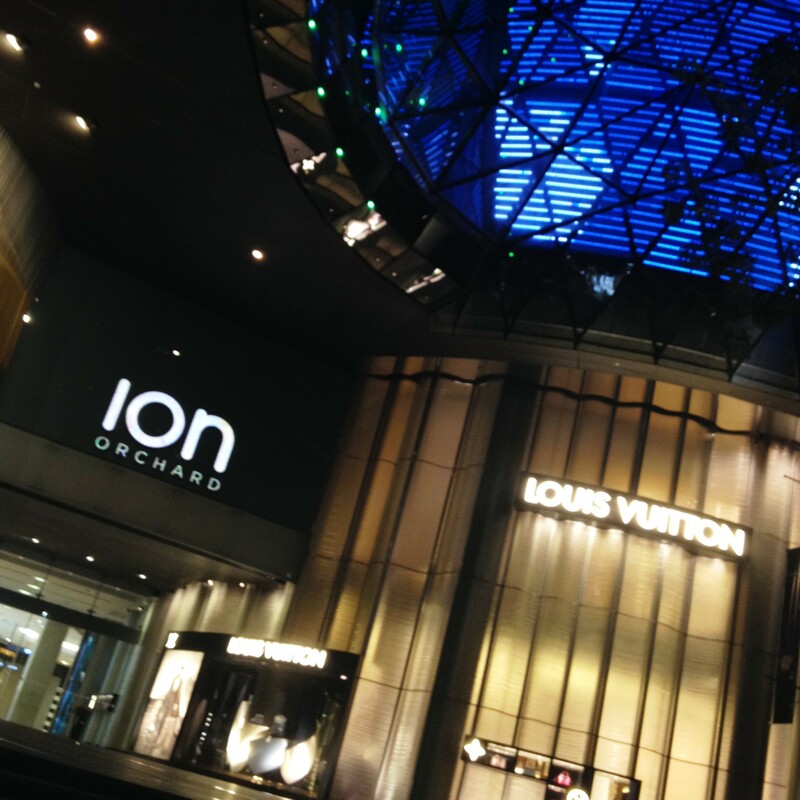 The façade of ION on Orchard. I hear the word “ION” and my senses are arrested by thoughts of a positive charge powering and energizing Orchard Road. So apt. ‘Leisurely’ is the operative word to guide the pace of shopping on this famed street. While the sheer number of shopping options that dot the whole stretch may prove to be dizzyingly daunting to the faint of heart, the lineup of 22 shopping malls – the best of which house under one roof an eclectic mix that juxtaposes world-famous mainstream luxury brands with labels that have yet to garner the same global attention – and six departments stores could very well be the playground of the tasteful rich. Think Aspen minus the snow. 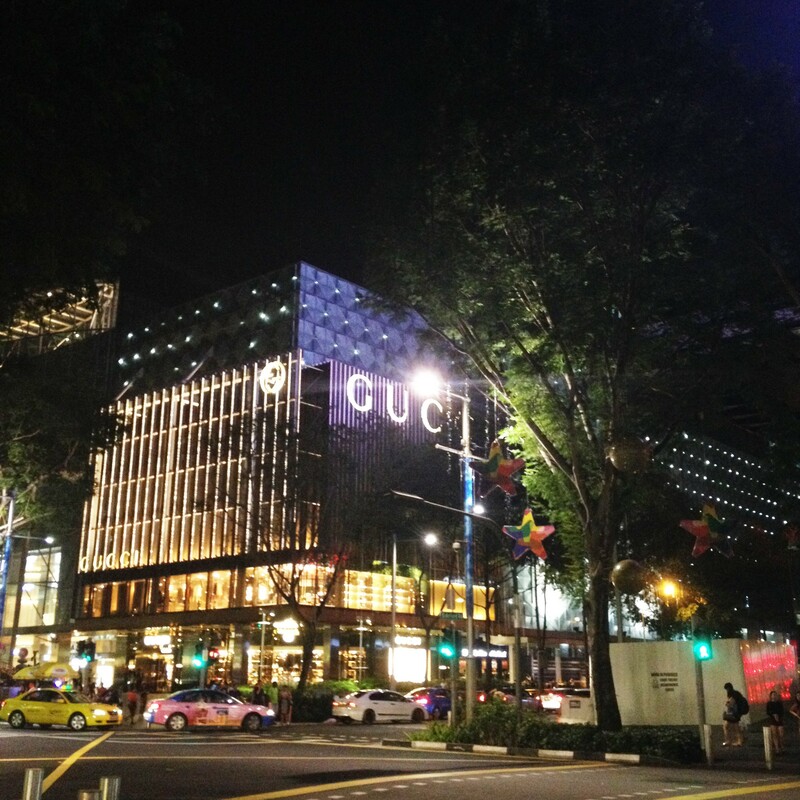 This claim was all the more put to fore after Presence Mystery Shopping, a Paris-based marketing consultancy firm, revealed in 2012 that Singapore’s Orchard Road came out in first place on the list of the world’s best shopping streets. The more seasoned in retail therapy would be quick to zoom in on the ranking and would be quite surprised to see that of the 29 other iconic shopping destinations on the short list, Orchard Road beat Paris’s Champs Elysées, 16th place, and New York’s 5th Avenue, 26th, by a wide margin. ION Orchard on 2 Orchard Turn is “where it all comes together.” Imposing at daylight when the rays of the sun hit the award-winning architectural latticework and more captivating at night time when the multi-sensory multi-media façade comes to life, ION Orchard has come to be the flagship of the Singapore shopping experience. The play of lights and virtual short films on display perfectly set off a veritable marquee of who’s who in the world of fashion and style – Cartier, Louis Vuitton, Prada, Dior, Giorgio Armani and Dolce & Gabbana. You can step into its cavernous space – eight levels of covetable brands – and instantly feel that if appearances alone make for the best shopping street, you could not be at any better place. But then again, the street offers plenty of equally tempting choices. So off you go. 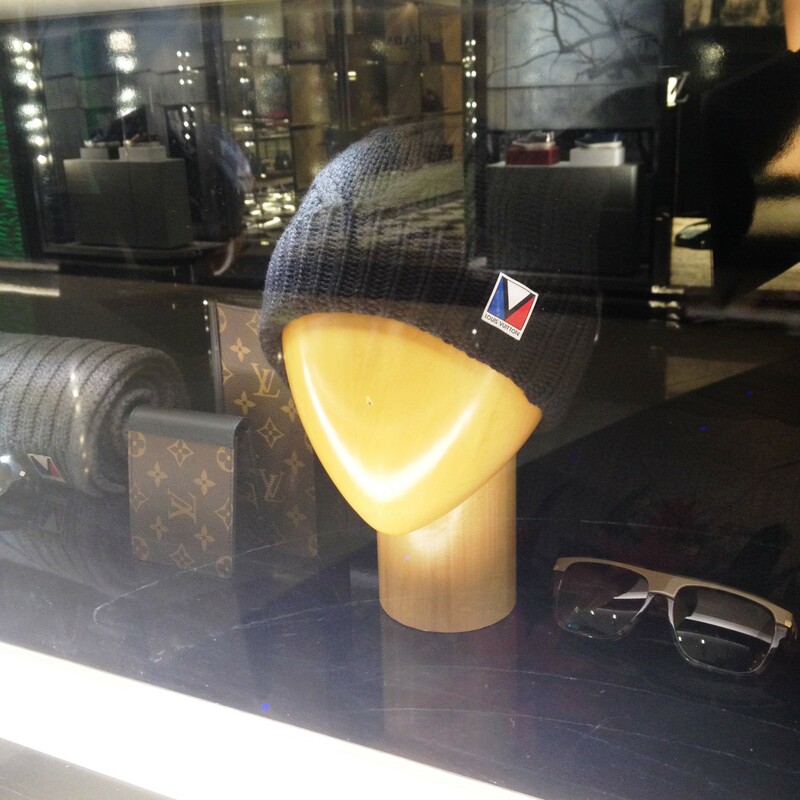 A beanie by Louis Vuitton. I love how the Louis Vuitton logo is composed of the colors of the Philippine flag. Like slices of medium rare lamb strewn atop mesclun greens, contemporary pieces of art are scattered all over ION on Orchard. And it has to be said, beautifully so. 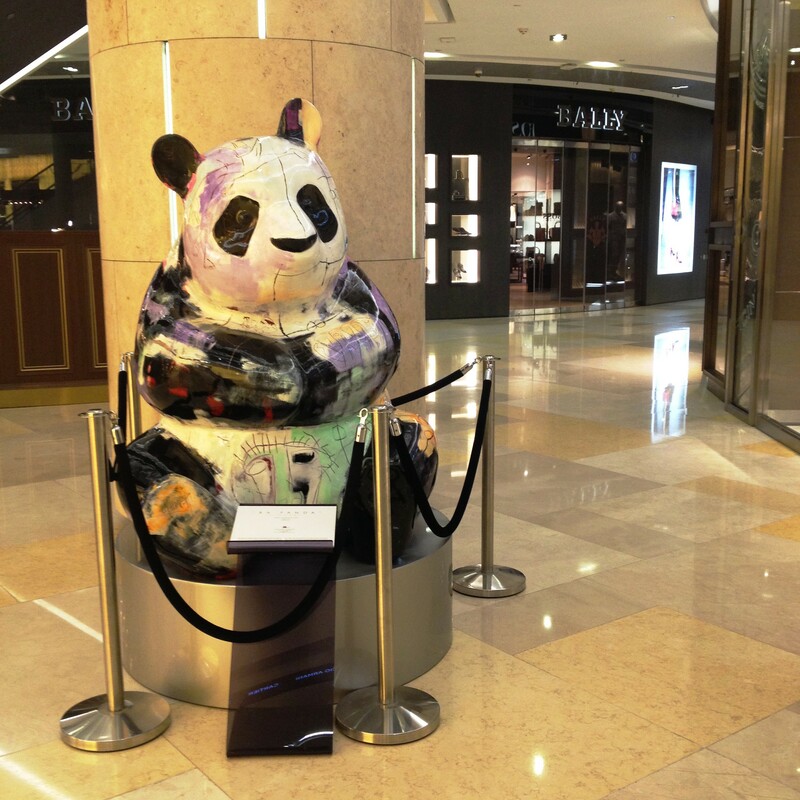 This one is the “BA PANDA“, a painted bronze sculpture, by Julien Marinetti. Across the street from ION is Wisma Atria, fresh from a facelift in 2012 that welcomed the Tag Heuer flagship store to its fold. 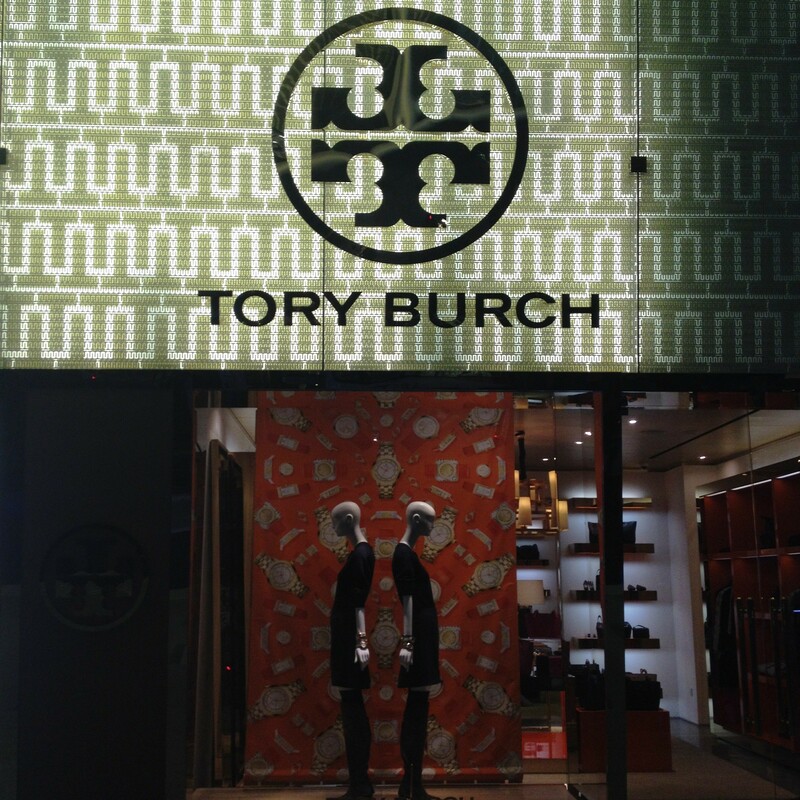 Sharing equal billing on this strip is the eponymous fashion label Tory Burch, a name synonymous to preppy-bohemian chic, business savvy and philanthropy. But before these brands bannered the new and improved Wisma Atria, it has long been anchored by one of its top tenants leading Japanese department store Isetan, the GAP, and Nike on two levels of athletic shoes and apparel love. 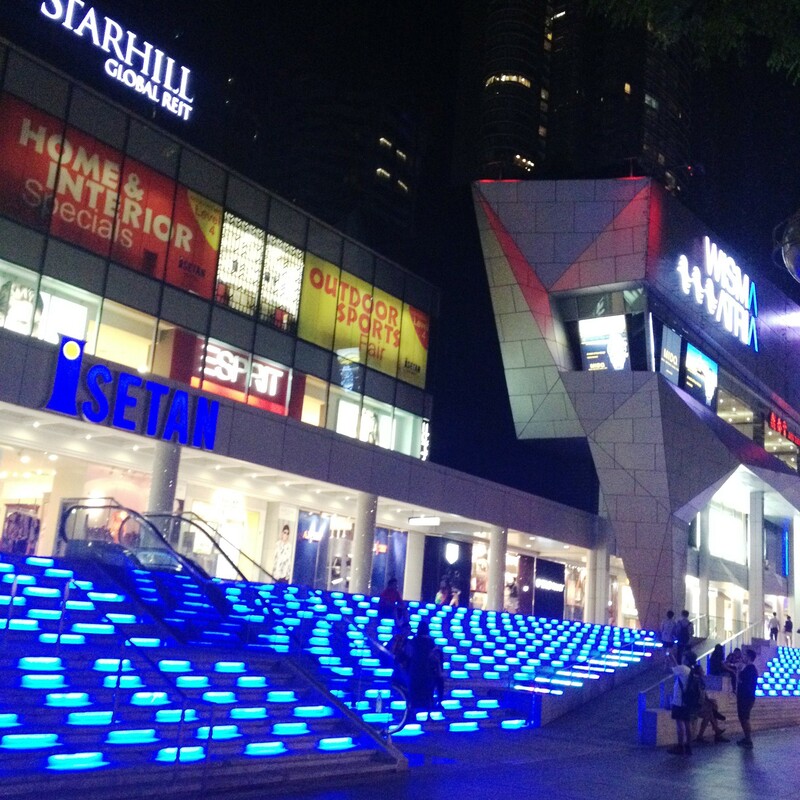 These and about a hundred other specialty stores are Wisma Atria’s claim to fashionista heaven – and haven – fame. Blue is the warmest color. And it has always been synonymous with Wisma Atria. 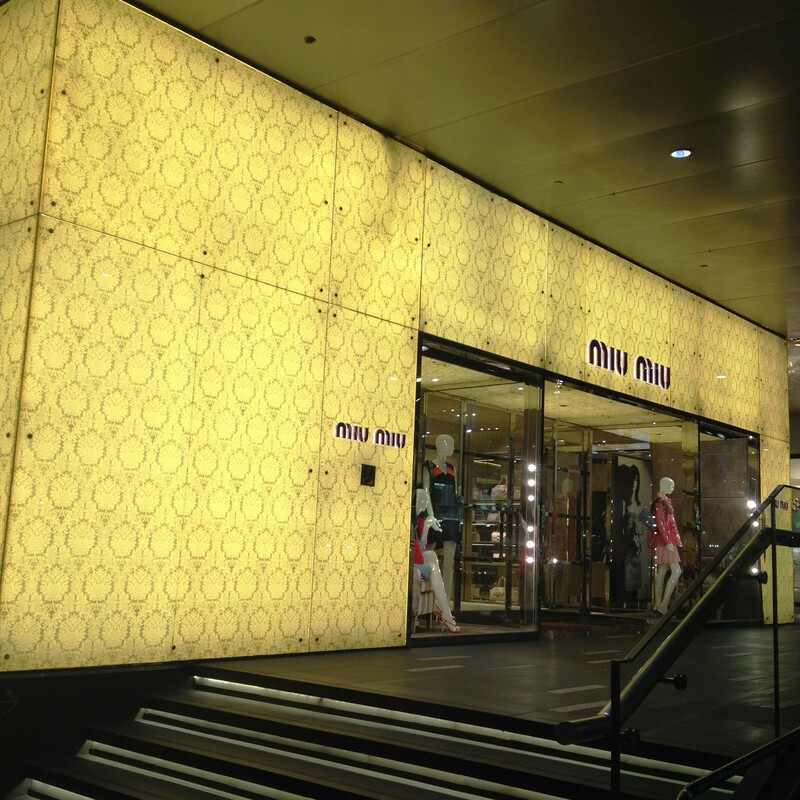 The façade of the Wisma Atria store of Tory Burch‘s eponymous label. There’s no better address for one of the world’s most powerful women. So, Matthew McConaughey is wearing HAMILTON in his latest movie INTERSTELLAR. 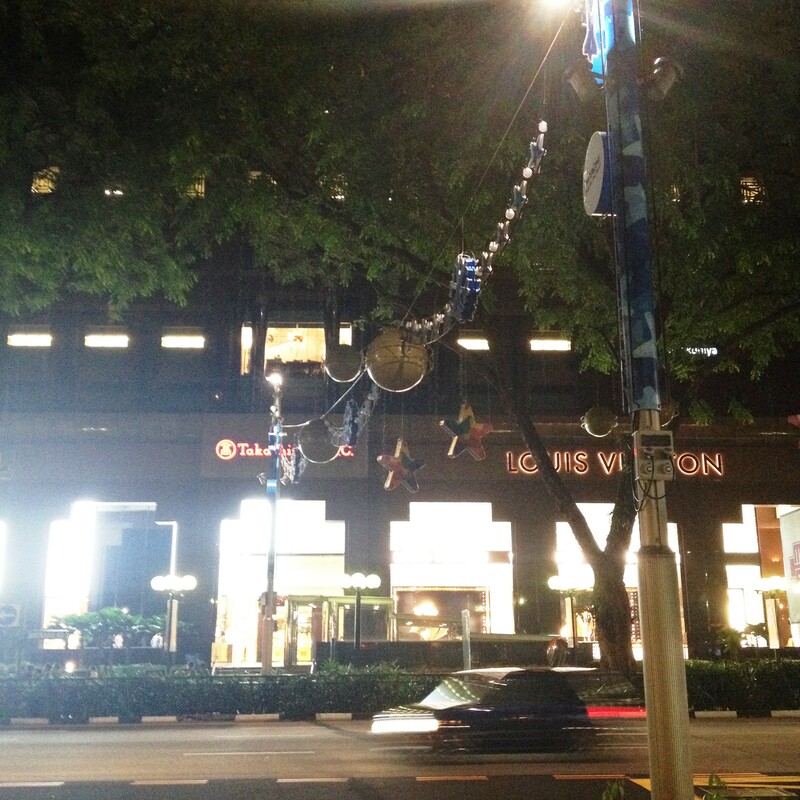 Further down Orchard Road is Ngee Ann City, the place where there is “something for everyone” beginning with the lovers of two of the most iconic names in the world of style and merchandising – Chanel and Takashimaya Department Store. In keeping with the times, Chanel has just recently undergone a sprucing up and has come out fiercer in their window displays that marry the traditional (those quilted 2.55s will never go out of style) with the cutting edge (have you seen their mix of materials and the cute backpack?). It has always been on a par with fellow tenant Louis Vuitton which in recent memory has enticed with their aviator-themed displays and collaboration with renowned Japanese artist Yayoi Kusama. But still it is Takashimaya that anchors Ngee Ann City in its rightful place as a staple on the world’s best shopping avenue. This photo doesn’t convey how compelling or I guess, inviting, the façade of Ngee Ann City is at night time. But I’ve come to love this snapshot as it shows how the trappings of luxury and modernity marry harmoniously with nature, quite evident with the number of trees that dot Orchard Road. 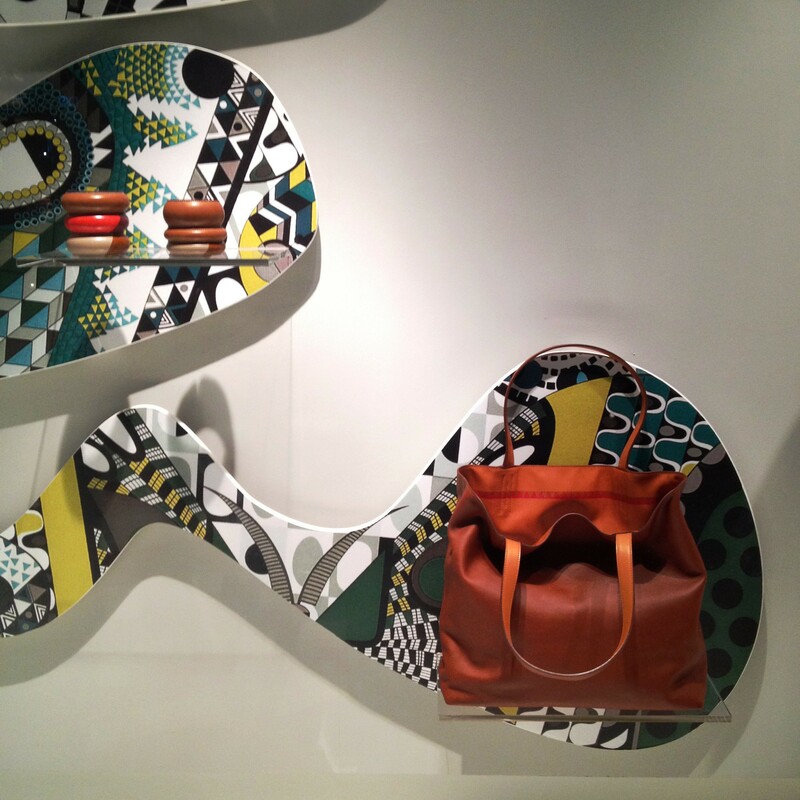 This leather bag sit unassumingly at the display window, until closer inspection reveals the impeccable craftsmanship that can only be Hermès. 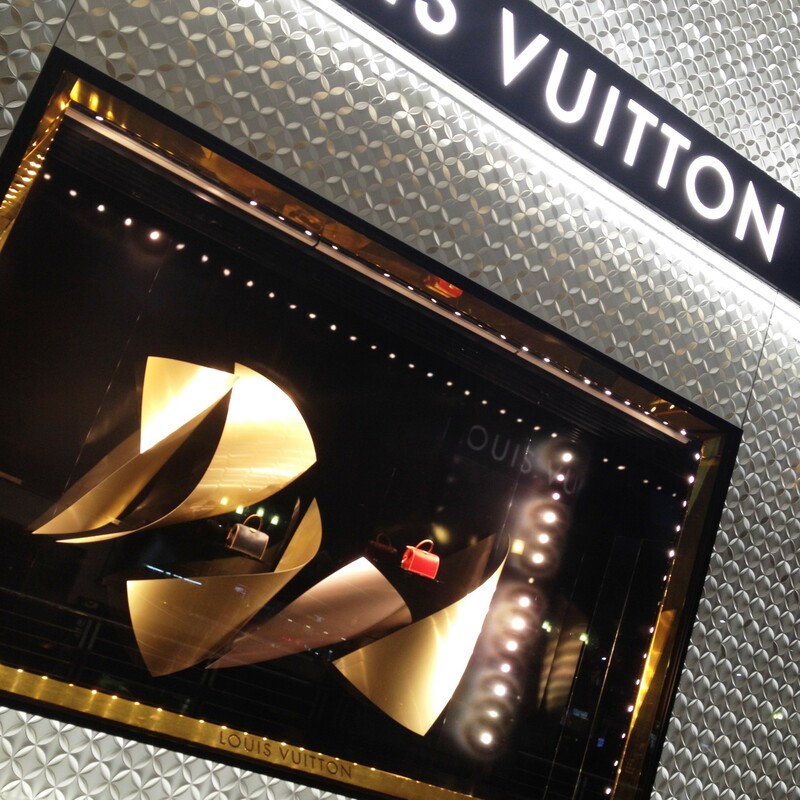 Louis Vuitton has always had amazing window displays. They are a spectacle all their own. Tells you that luxury is (should be) synonymous with high quality and work of art. If it’s another layer of sophistication you’re after, then the Mandarin Gallery may just be the place for you. Home to Bell & Ross and Montblanc, the place can surely remind you that there is a time for indulgence after all. And it could very well be a handsome timepiece on your wrist, just what you need to time your pace as you check out the sartorial offerings at Paul Smith, Emporio Armani, Marc Jacobs and Y–3, just a few of the undoubtedly well-curated selections at this “gallery.” If you feel like you’re starting to lug around more than you had initially hoped, a sturdy and well-crafted Mulberry might just be the bag you need – to carry your loot in style, as well as your daily essentials. 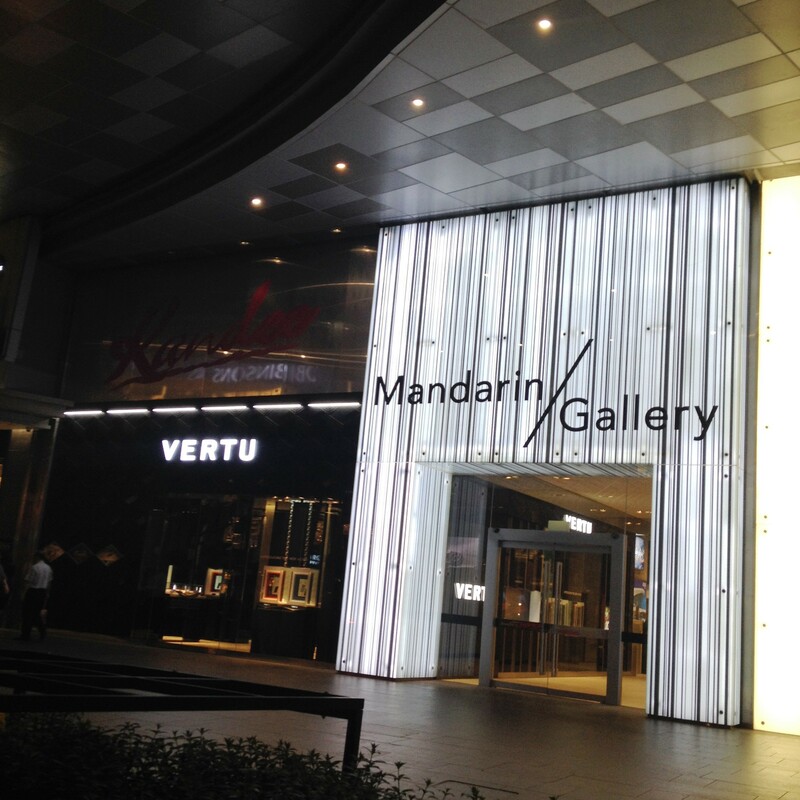 Mandarin Gallery, with all its lighting treatment, is always a visual feast. 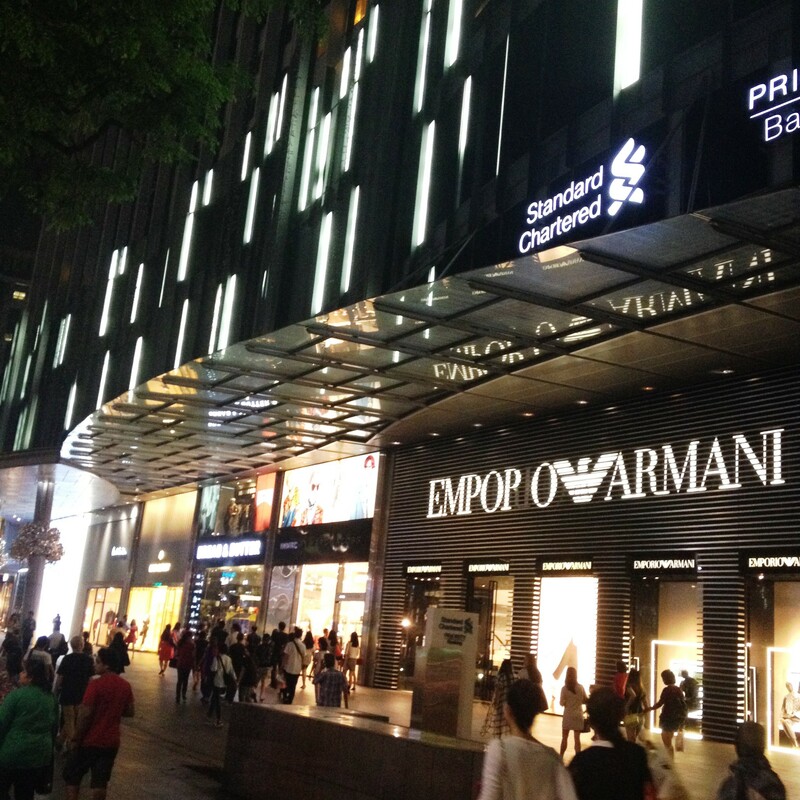 Coming from ION on Orchard, Mandarin Gallery is an array of namedroppables, beginning with EMPORIO ARMANI. 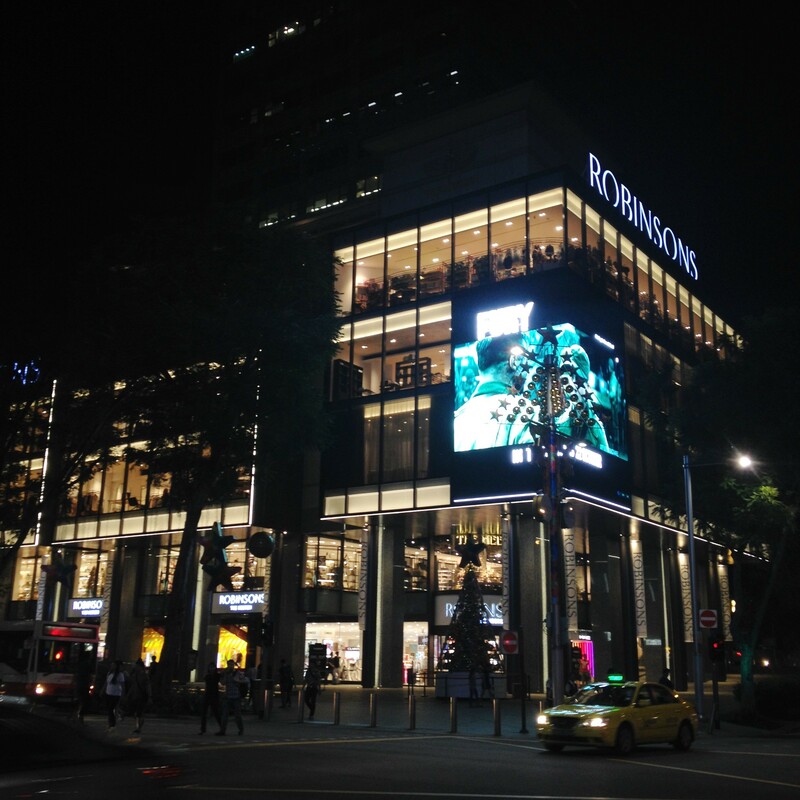 The attention-grabbing storeys-high LED screens that have shaped the Orchard Road skyline echo the recent influx of high-end mass-market labels to this center of luxury. 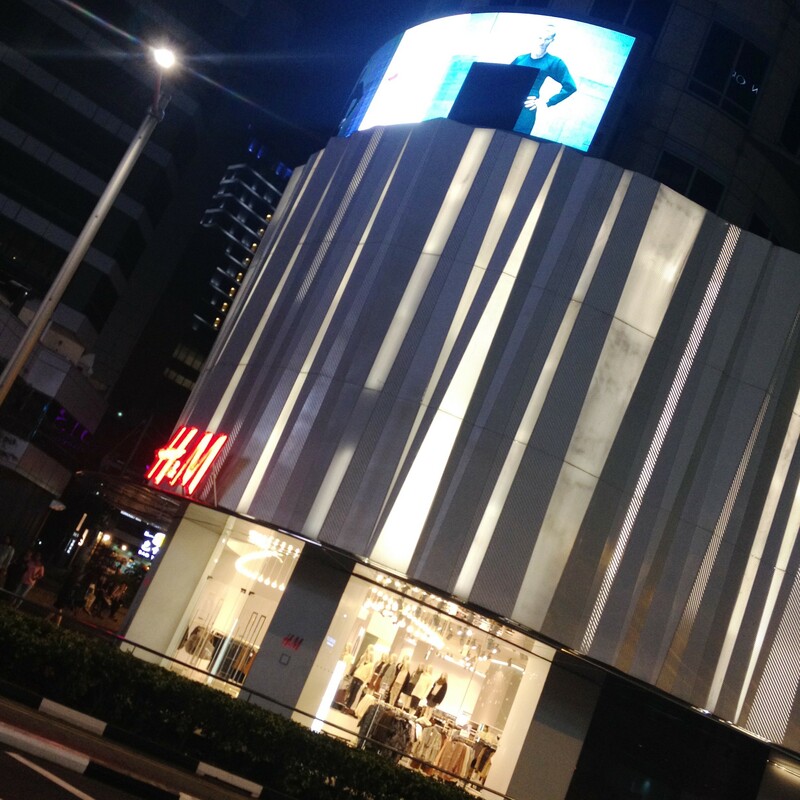 Abercrombie & Fitch and H&M – both of which opened to much fanfare and queuing frenzy – hog one of the belt’s busiest intersections, on the way to 313@somerset, the address Forever 21’s flagship store calls home. At this mall, style of European provenance – Zara – stands vis-à-vis the fashion sensibility and multifarious offerings from the land of cherry blossoms – Uniqlo. Crossing the street to our next stop! 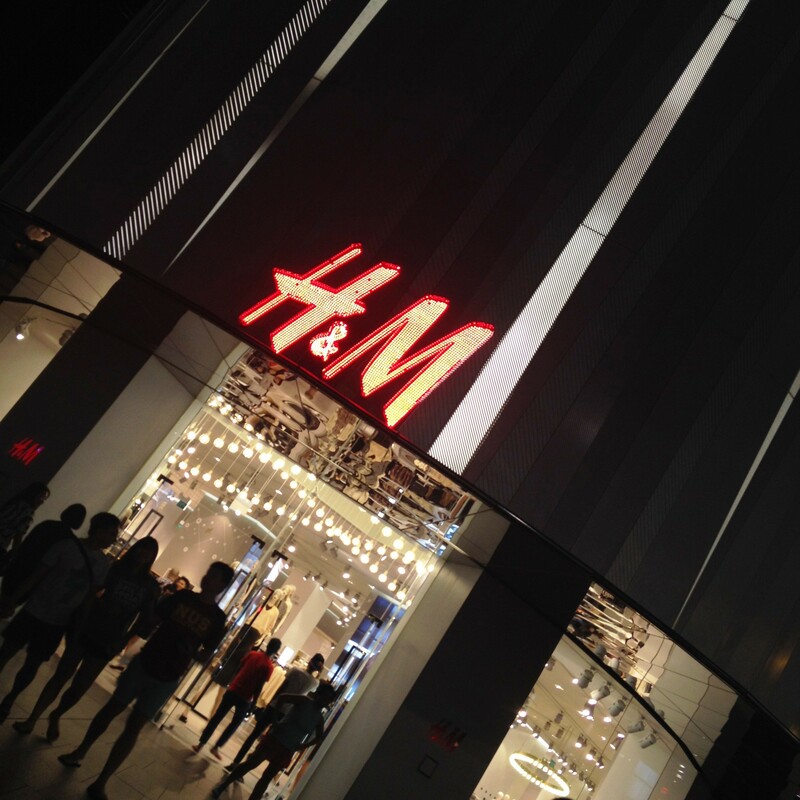 Where there is H&M, there is a crowd. No matter what time of day. 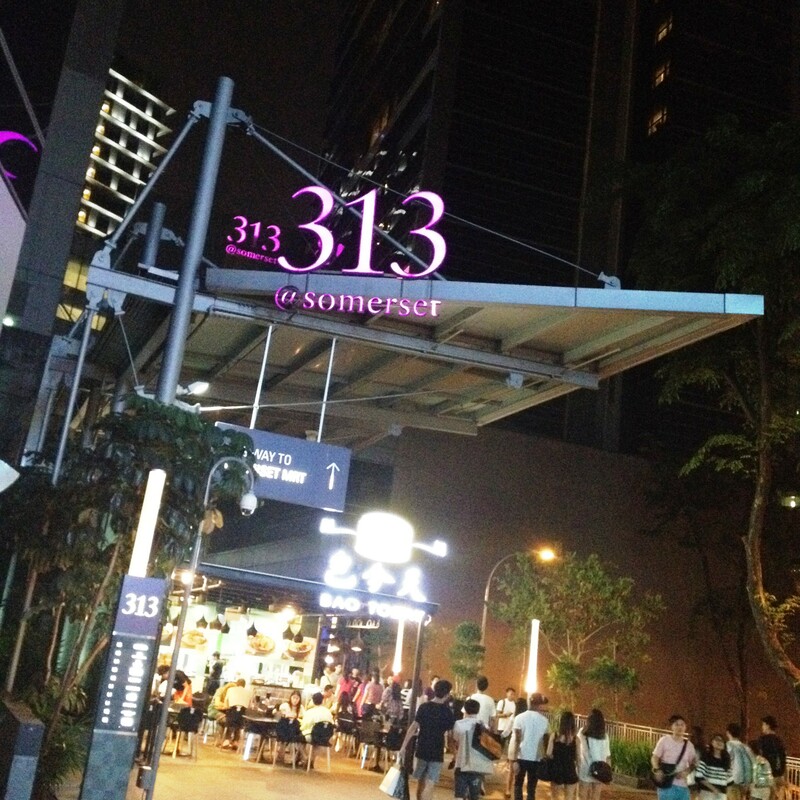 The walk to 313@somerset on its own is paved in luxury of the gastronomique nature. 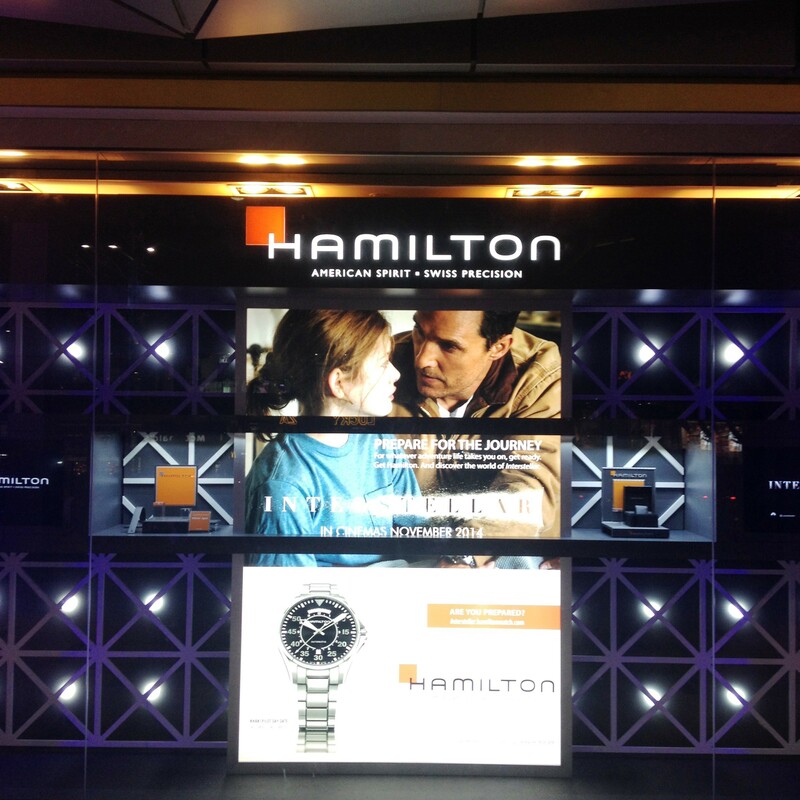 From the convergence of purveyors of style basics, it’s back to upmarket choices at luxury central Paragon Mall. Mirroring the enticing sight that is ION Orchard, Paragon shimmers amidst this seeming paradise with its lit-up Miu Miu storefront, opposite from the virtually gilded Gucci façade that makes a case for that oft-spoken line “all that glitters is gold.” Inside, its rather unassuming interiors belie the affluent choices that are bubbling to the surface, waiting to be consumed. You see it in the perfect tailoring at Alfred Dunhill, and the exceptional pieces at Salvatore Ferragamo and Bulgari. 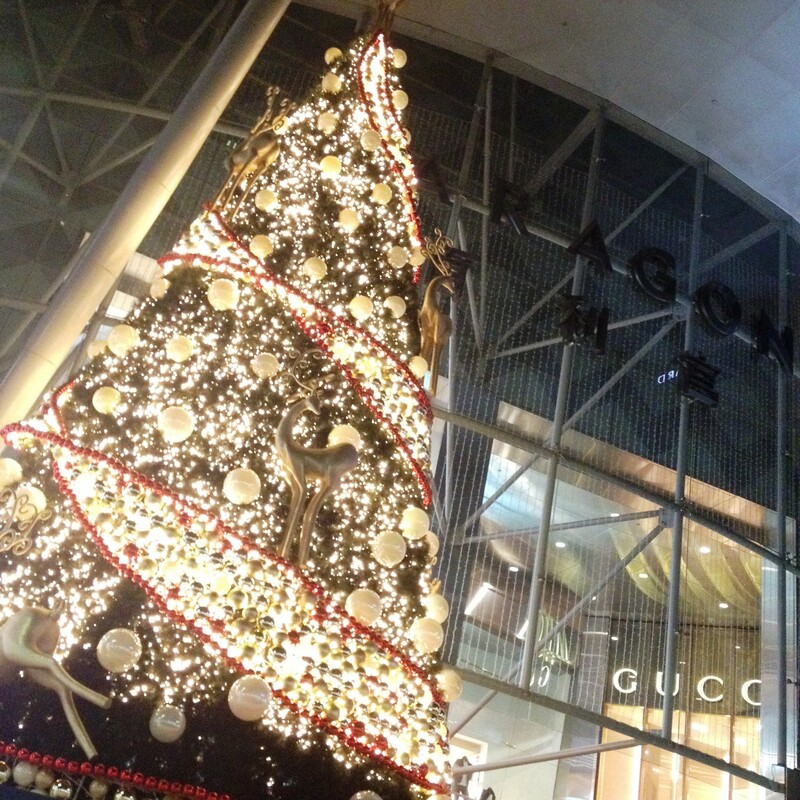 Paragon Mall is dressing up for the holidays! I see this and couldn’t help but burst into song. Though the weather outside is frightful… Hahaha! …and by Gucci on the other. The ROBINSONS Department Store building is a requisite stop too! Appearances do seem to make for what the world calls as the best shopping street. But with its wide open spaces, clean pavements and service staff with a ready, welcoming smile, Orchard Road clearly has one up against any other world-famous shopping haunt. 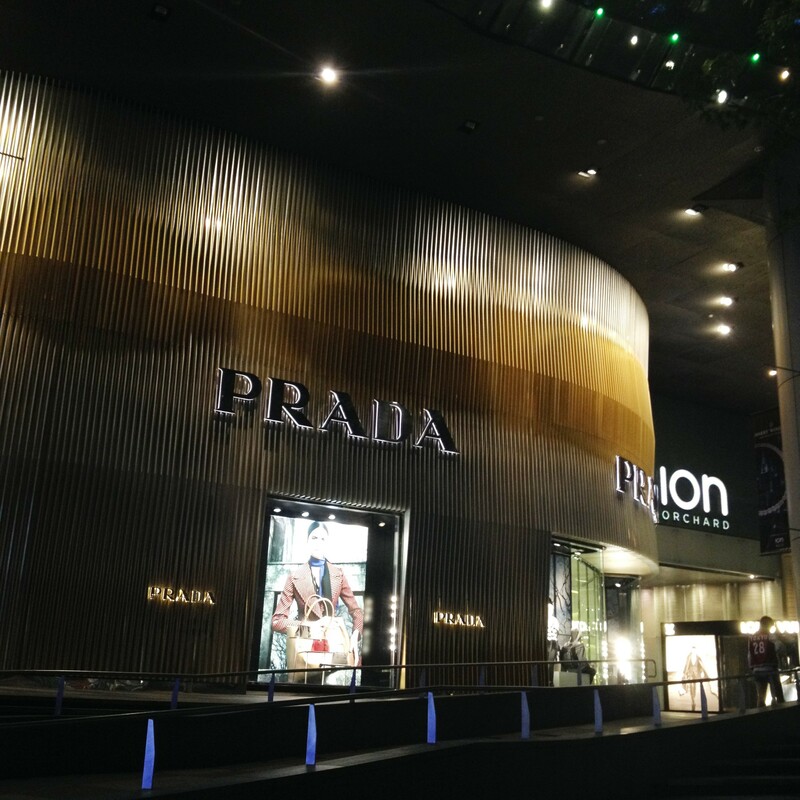 Here in the Lion City, these shopping malls fling their doors wide open to welcome you for the ultimate in luxury retail experience. But while the images of multi-media wall screens and well-lit windows from the outside haven’t fully left your cerebellum convolutions, you soon realize that in their place is inching your own smile – brought about by a usual day at the mall turned into a pleasant multi-sensory jolt – that best speaks of the luxury that has not lost its luster. Copyright © 2014 by eNTeNG c”,)™©’s MunchTime™©. All rights reserved. Where in the world are eNTeNG c”,)™© MunchTime™©’s Readers?